Domestic biofuels are an attractive alternative to petroleum-based transportation fuels. Biofuels are produced from plant matter, such as sugars, oils, and biomass. This plant matter is created by photosynthesis, a process that converts solar energy into stored chemical energy in plants. However, photosynthesis is an inefficient way to transfer energy from the sun to a plant and then to biofuel. Electrofuels--which bypass photosynthesis by using self-reliant microorganisms that can directly use the energy from electricity and chemical compounds to produce liquid fuels--are an innovative step forward. Lawrence Berkeley National Laboratory (LBNL) is improving the natural ability of a common soil bacteria called Ralstonia eutropha to use hydrogen and carbon dioxide for biofuel production. First, LBNL is genetically modifying the bacteria to produce biofuel at higher concentrations. Then, LBNL is using renewable electricity obtained from solar, wind, or wave power to produce high amounts of hydrogen in the presence of the bacteria--increasing the organism's access to its energy source and improving the efficiency of the biofuel-creation process. 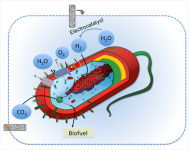 Finally, LBNL is tethering electrocatalysts to the bacteria's surface which will further accelerate the rate at which the organism creates biofuel. LBNL is also developing a chemical method to transform the biofuel that the bacteria produce into ready-to-use jet fuel. If successful, LBNL would create a liquid transportation fuel that is cost competitive with traditional gasoline-based fuels and 10 times more efficient than existing biofuels. Cost-competitive electrofuels would help reduce U.S. dependence on imported oil and increase the nation's energy security. Widespread use of electrofuels would help limit greenhouse gas emissions and reduce demands for land, water, and fertilizer traditionally required to produce biofuels. A domestic electrofuels industry could contribute tens of billions of dollars to the nation's economy. Widespread use of electrofuels could also help stabilize gasoline prices--saving drivers money at the pump.